Jahi McMath, Teen At Center Of Medical And Religious Debate On Brain Death, Has Died McMath was put on life support in 2013 after a tonsillectomy. Doctors said she had irreversible brain damage, and a coroner issued a death certificate. Her mother never agreed with that assessment. 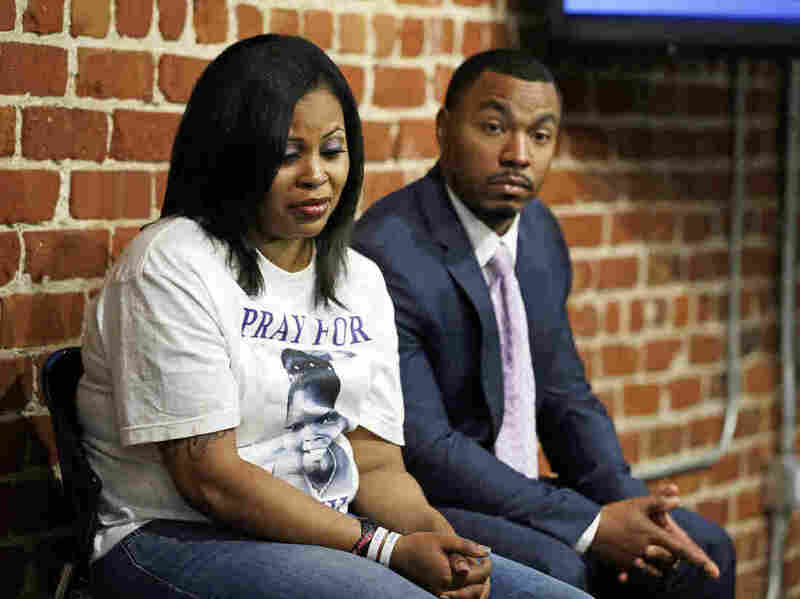 Nailah Winkfield (left) and Omari Sealey, the mother and uncle of Jahi McMath, listen to doctors speak during a news conference in San Francisco in 2014. Jahi McMath, the teenager who was at the center of a medical and religious debate over brain death, has died, according to her family's lawyer. She was 17. McMath died June 22 at a hospital in New Jersey, the family's lawyer, Christopher Dolan, said in a statement. He said a hospital doctor listed the preliminary cause of death as bleeding due to liver failure. Nailah Winkfield, McMath's mother, said in the statement that she is "devastated by the loss of her daughter" but that Jahi ultimately "has forced the world to rethink the issue of brain death." McMath had been on a ventilator since 2013. In December of that year, she had a tonsillectomy at UCSF Benioff Children's Hospital Oakland in California, which resulted in complications. Doctors there said McMath had irreversible brain damage, and a coroner issued a death certificate. But Winkfield refused to agree with that assessment and took the battle to court to keep McMath on life support. She cited her Christian beliefs and that her daughter still sometimes moved her toes and fingers. Winkfield believed that her daughter was not dead. A judge extended life support for McMath, who was 13 at the time. Eventually, Winkfield transferred her daughter to a hospital in New Jersey. According to a New Jersey statute, death can't be declared "in violation of individual's religious beliefs." This legal battle spurred a nationwide debate over brain death — and what constitutes death. The Uniform Declaration of Death Act, which has been in place since 1981, defines death as the "irreversible cessation of all functions of the entire brain, including the brain stem." In the world of medical ethics, as NPR's Maanvi Singh reported in 2014, there are varying views on death. "There's the commonly accepted view that a person is dead when all brain functions cease," Singh wrote. "But there's also the view that a person is only dead after their heart stops beating." And another view, according to Singh, holds that "a person can be brain-dead even if certain minor functions of the brain remain. For example, if a patient shows a gag reflex, but no other signs of life, they should be considered brain-dead." Winkfield continues to assert that her daughter died June 22, 2018 — not in 2013. "Jahi McMath was not brain-dead or any other kind of dead," Winkfield said in a statement. "She was a little girl who deserved to be cared for and protected not called a dead body. When she finally was treated like a human being, she got better." Winkfield said the way she communicated with her daughter might not have been like how other parents communicate with their children. But she said that her daughter's heart rate would increase when Winkfield walked into the room, and that her daughter could respond to Winkfield's voice with slight body movements. Dolan, the family's lawyer, said, "The fight to hold the negligent doctors who allowed Jahi to suffer a severe brain injury will continue." He has filed a wrongful death suit in California Superior Court in Alameda County, as well as a federal lawsuit seeking to have her 2013 death certificate reversed and her date of death marked as June 22, 2018.